A fitting end to a series with some of the most memorable characters ever. "The dream of long-term peace was so short lived." - Azalyn, Gozo the 16th. Time has lapsed and situations have changed. For the Soyokaze and its crew this means they have been assigned to ground duty and plans are underway to scrap the ship that lead to the most unique victory in history. The crew spends their time in a variety of different ways. For some it means doing other work in the United Planets Space Forces, for others it's training for future missions, and for still others it's being lazy. But, the one thing that they all agree on is that they are still a crew and spend as much time together as possible. When the UPSF learns that a fleet of their ships have been destroyed on the frontier, an investigation is set in motion that leads to a mystery that is greater than anyone could have suspected. The mystery only begins to deepen as Yuriko Star begins to uncover details about the incident; details that could mean that the Raalgon Empire might not have been involved. Meanwhile, the Raalgon Empire has begun to split under Azalyn's rule and it has been decreed that the only way to achieve total peace is to send all the Raalgon ships in the empire to attack the UPSF in one final, climatic battle. But, what is this signal for peace that is being transmitted at regular intervals from inside the Raalgon Empire? And through it all, Captain Tylor must just sit by and watch as the events unfold. But this isn't Tylor's story anymore. No, it's much greater than that. This has become the story of the Raalgon Empire and the United Planets Space Forces and how the threads of peace become tattered over time. Can true peace ever really exist? Or is peace really war in disguise? Parts one and two of "From Here to Eternity" seem to hold that answer if you are keen enough to catch it. These being VHS tapes, I'm not expecting much in terms of crisp picture. But, it is distracting when the animation quality has a dark tone on it due to the video. I should note that I wear glasses to read subtitles and am able to pick up picture problems more easily due to my increased perseptive abilities and I have been able to see this on previous Tylor videos that I've watched. So I'm just going to chalk this up as how Right Stuf videos naturally appear because of the source material. On the other hand, I'm not as easy to let the subtitles off the hook. Because the subtitles are white with a black boarder, they tend to have a rainbow of colors when there are a number of different color tones on screen at once. At times, this even affects other whites that appear in the animation around the lines of moving characters. But, The Right Stuf should be commended because its subtitle translations has always seemed like a direct translation that has retained the integrity to the original script. From technical jargon to character jokes, the translation has been able to retain it with great ease. As for the timing, it's always easy to keep up with and read. Tylor, at its core, is a show for anime fans, and more importantly, fans of the Tylor TV series. But, even if you haven't seen a single episode prior to this final volume, you will be able to understand the plot and realize that all the characters were part of something much greater. 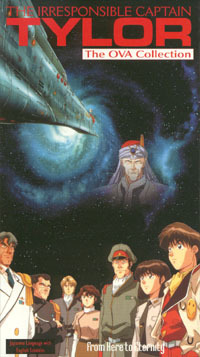 You might be wondering why the show was called The Irresponsible Captain Tylor when you first start watching the volume, but the story does all it can to help flesh out the large cast of characters without spending an insane amount of time on filler. Because of this, the volume can easily be viewed as a stand-alone two part movie. Its certainly got enough action and suspense to make any anime fan go into a salivating fit. For Tylor fans, the final two episodes tie-up the loose ends and give some sort of closure to the series while opening up a whole new avenue of stories that could spring forth. To talk directly about the ending would be to ruin the surprise that fans have been waiting for. But, the pay off, in my opinion, is well worth it in the end. And even though I may want to see more stories, I'm content with the way it ended. Because, for me at least, I know how it ends. And in a way, that's how the creators wanted it. Say goodbye to an old friend, relieve a dream, and a wish for new adventures. These are the aspects that make Tylor an enduring show that sticks with you.